How much does it take to make me full? What up my smoking friends? We had a surprisingly warm day here in Finland where autumn's quite far already. 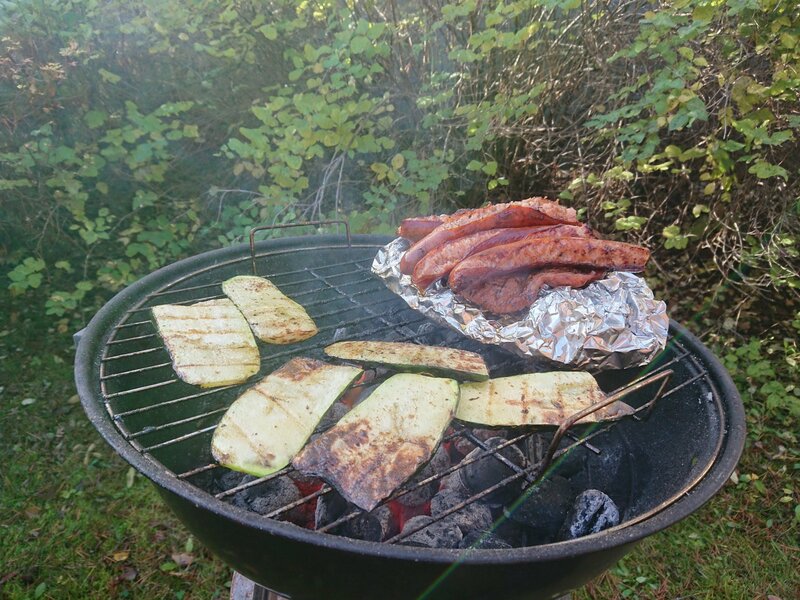 But feeling like a summer outside, I took my chance and enjoyed perhaps the last rays suitable for comfortable barbequing as if it was summer, with only a t-shirt on (and pants – I live in a row house, so need to think other people too). I ate all that food myself: kassler, sausage, zucchini, vegetables wrapped in folio and halved apples. Just a while ago I put my appetite to the test by trying this one food challenge in a restaurant: the objective was to eat the whole dish below in under an hour – 600 grams of beef, 600 grams of pork + potatoes – if you managed to do that, free meal. If not, then you'd have to pay 50€. Yeah, they serve it on a blank, because no original plate can carry such amount. The time proved to be the biggest if-factor as I anticipated, and there was no time for much chewing – or enjoying it for that matter – because it had to be stuffed down as fast as possible. I'm no pro in fast eating – I just like food and can eat lots of it – so it came really close time-wise. Although I gotta say that it came right to the limit of my capacity too; when I had only few potatoes left, I was really close to throwing up, but I suppressed the reflex, because failure wasn't an option so close to the end (nor paying 50€ if not necessary, lol). No doubt, I was quite full, and didn't have to eat for a good while after that. It was really good still though – I took barbeque sauce and seasoned butter, which really well complimented the stakes, and made swallowing easier – dry food is much harder to eat faster. That's usually the side-effect of showing food. The only option I know as a cure is eating. Unfortunately a prescription of 'one eating' or even a packet of 'thirty eating' isn't a permanent solution and you always need another one soon after the previous dose. Kind of is,and kind of isn't; sometimes I get so occupied with stuff, especially when traveling, that having to eat feels like a burden. But then again, I love stuffing my stomach full of food from time to time. Hahaha you have the same concern as me regarding the munchies! :D Let's compare notes when the times comes. Ruben said there's cheap cheese in Netherlands. Perhaps taking 1 kg of that with the weed would be an appropriate hunger management solution.